Each pack comes with all the accessories needed to hang or display the items. You buy and assemble. It’s that easy! Comes in three colours. 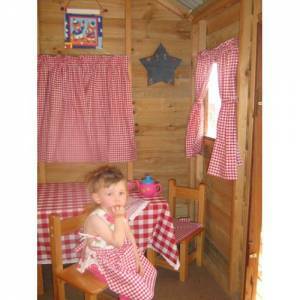 Red and White Gingham, Navy Blue and White Gingham and Pink and White Gingham. 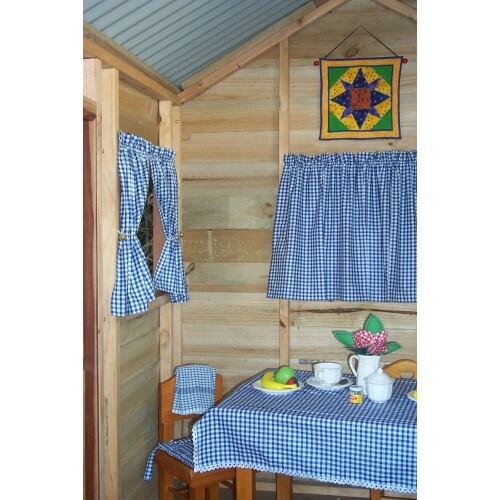 Curtains are made to fit all standard sized cubby houses (playhouses) and are Australian made. 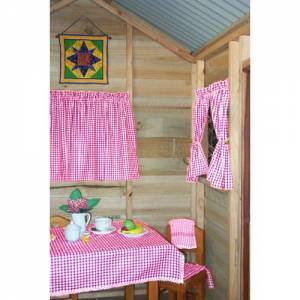 Curtain Sizing: 57.8 cm / 20 ¾” width x 58.4 cm / 23” length per panel at 2 panels per window. Finished width allows for gathering on rod. Curtains are sized to fit a standard window dimension of 65.5 cm / 25 ¾” width x 49.6 cm / 19 ½” height. Curtain rod and hanging hardware are included. Material varies; 100% cotton or 50% cotton 50% polyester, according to colour and pattern. **Please also note that sometimes the colours and check sizes do not match the picture shown. We are located in Doncaster Victoria, so local pick up is available upon request.